The size of this gathering attests to how well known he was, how well regarded he was in this community and much further afield, and how he touched and influenced the lives of so many through his life time roles as a brother, teacher, soldier, husband, father, grandfather, friend, mate, artist, Lion, fisherman, golfer, gallery member, war historian (see Snippets From The Western Front), advisor, elder statesman and visionary of our town. That’s just some of the themes, I’m sure there are many more that are certain to be expanded upon this morning. Ross was passionate about our local environment from foreshore to Bell Park to high rise issues and his influence and his legacy lives on. 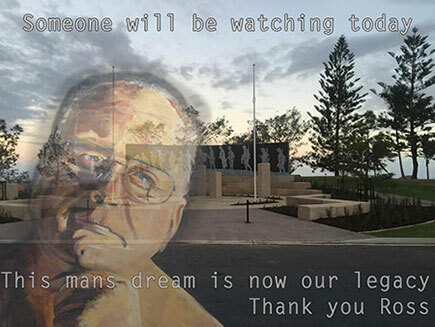 What a fitting memorial it would be if his Anzac Plaza (See Visions Anzac Plaza) concept were to come to fruition right here where we stand assembled today to pay our respects to Eric Ross Coulter. April 18th, 2015. The Official Opening of Stage 1. Copyright © 2019 Ross Coulter Memorial – Emu Park. All Rights Reserved.